Materials and Method: This study was done between 2014 and 2015 at Karabük Education and Research Hospital ICU. 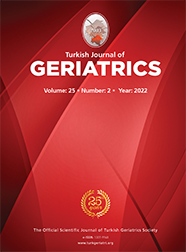 Who were older than age of 80, operated for hip surgery and monitorized at ICU postoperatively included to study. Results: The mean age of our patients was 84.65±3.36 years, and 50 of them were female (69.44%). 40 patients showed trochanteric femur fracture and 32 showed femoral neck fracture. Proximal femoral nail was implanted in 38 patients and partial hip prosthesis in 34. Regional anesthesia was administered to 57 patients and general anesthesia to 15. The hospital mortality rate was 16.6%.When we grouped the patients as surviving (60) or died (12), we found that the time before surgery was significantly longer for the died patients than for the surviving ones. The need for MV, duration of MV, and the need for inotropic agents were higher in died patients. The duration of ICU follow-up and hospital stay were longer for died patients. Other parameters showed no significant differences.